In the latest (Oct./Nov. 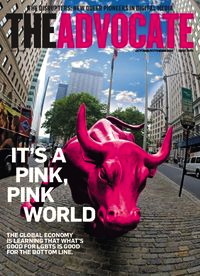 2014) issue of The Advocate (the glossy newsmagazine targeting an lgbt audience), two items with some linguistic interest: an ad campaign from Burger King choosing wording to frame its ads for this audience; and an instance of the first X to …, with a domain X that at first seems preposterously particular but turns out to be possibly useful after all. … The Proud Whopper was, in fact, exactly the same as the regular Whopper except that it was wrapped in a rainbow paper; inside the wrapper text read, we are all the same inside. It’s a clever, sweet message. Support should always be welcome, unless it’s mere marketing luring LGBTs to spend money on a company that does not live up to its claims. Debuting in Batman No. 475, [the character Renee] Montoya became a favorite among LGBT comic readers when she was outed as lesbian in the 2003 comic book series Gotham Central. Her appearance in the TV series Gotham will mark not only the first time a lesbian character has appeared in a live-action adaptation of Batman’s world but also the first time a lesbian of color will be a recurring character on any prime-time superhero series. But on reflection I came to see that there was some point in the description, in that it picked out a category that was likely to be of significance to the readers of the magazine, both lesbians and people of color being thin on the ground as central characters in the world of imaginative fantasy. This entry was posted on September 19, 2014 at 10:07 am and is filed under Gender and sexuality, Language in advertising, Semantics. You can follow any responses to this entry through the RSS 2.0 feed. You can leave a response, or trackback from your own site.